Lives lost exceeded 100 persons; cargo livestock & lumber camp supplies; location suspected between Lonely Island & Byng Inlet. Cost $35,000; put in Dominion Line, running Windsor ONT-Duluth, MN with steamer SOVEREIGN. 1873, Aug 19 Launched St. Catharines. 1873, Oct 6 Struck bottom near light house, Port Colborne, cargo wheat; sank in harbor. 1874 Merchant's Line, Montreal-Chicago; owned Graham interests. 1875, Sep 4 Running Windsor-Lake Superior Canadian ports; collided with schooner LEVI RAWSON opposite Fort Gratiot, Lake Huron. 1881, Jul 12 Sunk in collision with schooner HELENA, in St. Mary's River. 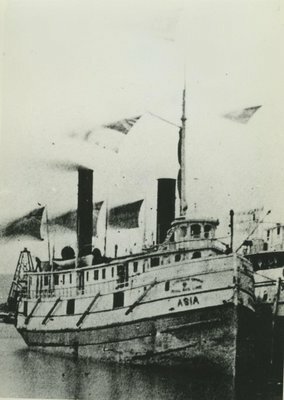 1881, Aug 3 Raised, repaired Sarnia. 1881 Chartered by Great Northern Transportation Co. to replace Steamer MANITOILIN. 1882, Sep 15 Lost in storm, Georgian Bay.